Elaina Roeder of Springfield, Missouri, started her season in style at the Scottsdale show. 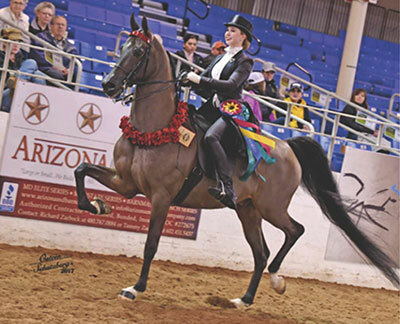 She and her partner, Danse All Night+, swept the Saddle Seat Equitation competition, earning first place in her qualifier and going on to become Unanimous Scottsdale Champion Saddle Seat Equitation 15-18. They were also unanimously first in the AHA Saddle Seat Medal. Elaina has been riding Arabians since she was 3. Now 17, she has had years to develop the elegant and subtle style she displays in the ring today. Her older sister started taking riding lessons first. “By watching her, I was hooked,” says Elaina.